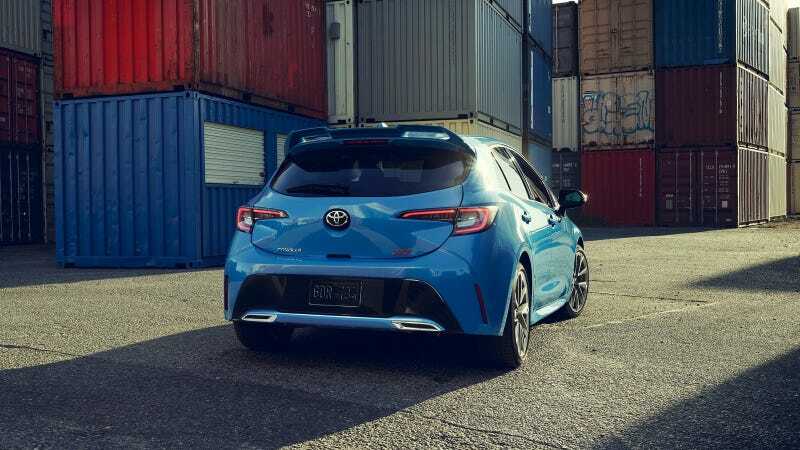 e just saw it at the 2018 Geneva auto show, but now Toyota's new Corolla Hatchback is on its way to the United States for a local debut at next week's 2018 New York auto show. The new compact hatch, which is called an Auris in Europe, is due in showrooms this summer as a 2019 model. It replaces the Corolla iM and will be joined shortly by a redesigned Corolla sedan. Both body styles will feature Toyota’s TNGA modular platform, which provides a lower center of gravity and increased body rigidity. The platform underpins several Toyota models already including the Camry and Prius. The new design represents a serious step up in quality and style for the humble Corolla, which is now in its 12th generation. 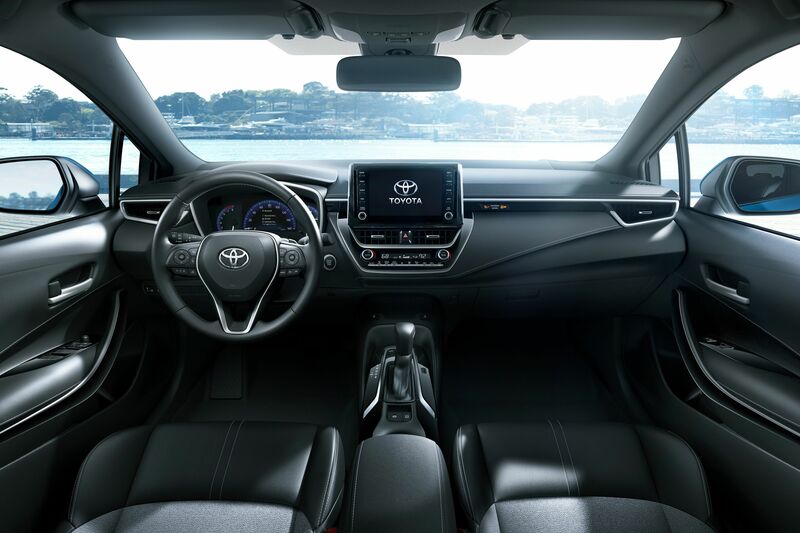 The exterior is definitely sharp looking, and inside there's cohesiveness and restraint in the design, which you traditionally haven't seen in Toyota products of late. 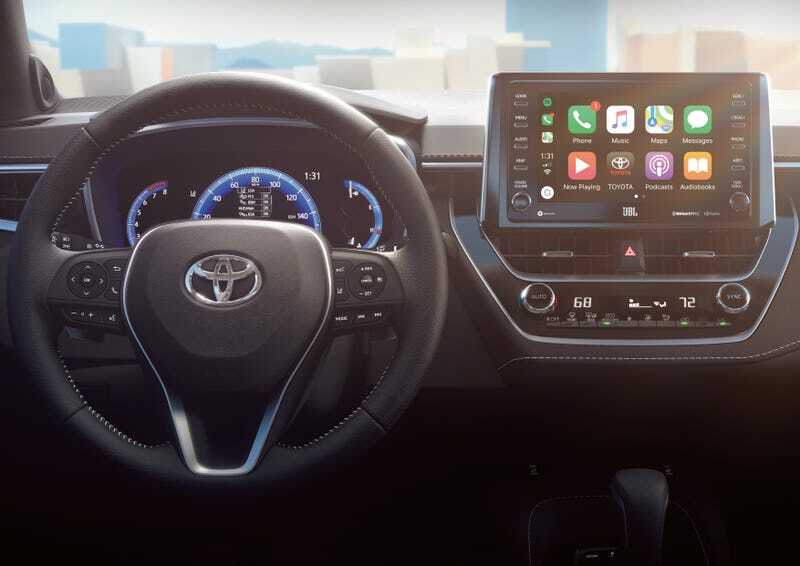 An 8.0-inch touchscreen comes standard with Apple CarPlay compatibility, a new feature for Toyota, but Android Auto is still missing. 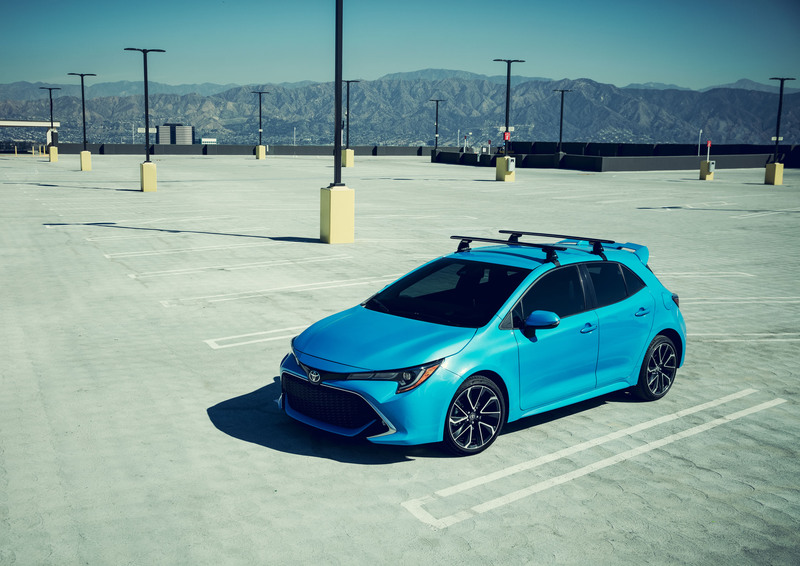 The sole powertrain for the U.S. is a 2.0-liter inline-4 engine that Toyota says is lighter and more powerful than the 132-horsepower 1.8-liter in the outgoing Corolla, and buyers will be able to select from a 6-speed manual or CVT. The latter is said to come with paddle shifters to sort through 10 simulated gears. Final powertrain specs will be announced at a later date. The N.Y. auto show starts March 28. Toyota will also use the event to introduce a redesigned RAV4. To learn about some of the other vehicles set to appear, head to our dedicated hub. And for more on the Toyota Corolla, read the in-depth reviews at The Car Connection. Looks pretty good. Just needs a hot version. Hmm looks like a nice car. Personally, I think the only that killed this car was the lump up front. Looks like a hot-wheels car. What's with all this juvenile styling? This engine in the Lexus UX 200 makes 168hp. That seems like a pretty solid power bump from the current Corolla iM. The 2.5 from the Camry at 206hp or the 2.0T from the NX300 at 240hp would make for a proper hot hatch. Considering that the Camry is rated at 39mpg with the 2.5, I expect this should be in the lower/mid 40s on the highway and could be a decent drive, too. Last edited by quentinberg007; 03-23-2018 at 11:51 AM. It looks pretty good. The front bumper is not the worst of Toyota's designs. The interior looks like a good upgrade. It is a good start for hopefully a hot hatch version. I like it. Looks ten times better than their sedanigans. Tommy Boy Doll couldn’t have gotten this more wrong. More and more hatches coming to US shores. Thank you Toyo, VW, Ford, Honda, Hyundai, etc. Yuck. It's a Matrix profile with a Yaris front. At least they ditched the tired 1.8. Confirmed 168hp per Toyota.com. I don’t think that we will see a hot version until the Mazda/Toyota joint venture plant comes up, but it seems like the groundwork is there for a reliable hot hatch. I loved my GTI, but I hated owning it due to reliability. i hope subaru is paying attention. They may need a downgraded turbo in the impreza sport much sooner than they think. even I have lost track. 168hp in a decent sized/compact hatch, with Toyota reliability, sounds like a pretty good daily driver. I have to say, I do like the looks of it in general, the back more than the front. This is definately screaming for a hot version. Not bad. I'd like to see an XRS trim with Camry 2.5L. The Kia Soul has a turbocharged version. No turbo, no care. It looks modern. That's a plus but not enough for people who want more than brand reputation for reliability. I hope its bigger than the iM. I was strongly considering it until I saw that my BRZ had the same amount of rear legroom. For a 4 door, it was ridiculous. My wife and I rented an Auris while we were on vacation. It was a solid commuter car for Europe. Easy to park, plenty of room in the hatch. The only thing was the rear seat legroom. Can't fit a grown human with legs in there. I love both the interior and exterior. 168HP and 6 speed manual sounds adequate to me as well. Add a header and aTRD exhaust and you are likely close to 180HP. All that’s really pending is the suspension setup, anybody have details on that bit? That's a really swell looking car. I think it's the first time a Toyota hatch has looked better than the Honda hatch. I’ve been eying the current Carolla iM as a new daily driver. I’d take the base 6MT, priced under $20K. This new model looks a bit funkier up front, but the added tech looks good and it’s distanced itself from the lower-end Scion design. Last edited by Skylab; 03-24-2018 at 04:10 AM. It appears that the 6MT will be available in SE and XSE trim. The iM starts at $18,500. If they can keep the 6MT SE in that same ballpark, that will be an excellent value. I really hope the transmission is good. My wife's '17 Clubman S has a 6MT with the All4 and it is so unsatisfying with the auto rev matching, super soft clutch, poor pedal placement, and imprecise shifter. Her '05 MINI had a much better transmission as far as engagement and my '15 FR-S feels light years better. This Corolla HB supposedly has the auto rev matching and such, too, so it could go either way. Definitely worthy of a test drive. So hoping they come out with a Zeonic version of the next Supra. This thing has less space in the back than a WRX sedan trunk. Googles say 12 cu ft for the WRX. This is supposedly 18 cu ft. That number is surely floor to ceiling, seatback to liftgate, though.